Few would argue that humankind is at the top of the food chain, what with our incomparable brain and tool-making abilities. Yet despite all of our achievements, if you put us in the same room as one of the species on this list, it may not turn out so well for team homo sapiens. The ocean is filled with wonderful creatures, but none so dangerous and deadly as the eight marine species below. You knew it had to be here. The great white shark is the poster boy for dangerous creatures, even though it doesn't cause as many deaths as some of the other species on this list. You can thank the movie Jaws for that bad reputation, or maybe it's because seeing something with five rows of teeth backed up by thousands of pounds of muscle is pretty terrifying. 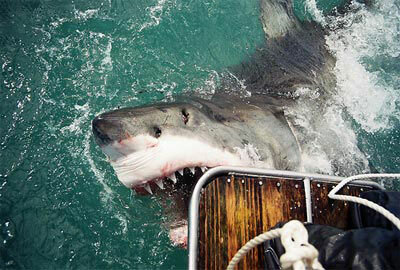 Either way, you don't want to be swimming around a 20 foot great white for the fun of it. Other notoriously dangerous sharks: tiger sharks, bull shark, and oceanic white tip. Must Read: Click here to read about the deadliest shark fishing accident ever. Winning Techniques: People actually FISH for these things! Watch how you can take fishing to a whole new level of adventure and danger with these crazy ways to bring in the big one. What's the most venomous snake on the planet? If you include ocean-going species, then the sea snake is the answer. In particular, the amount of venom a belcher's sea snake could inject is enough to make the king cobra look like a harmless earthworm. However, the key words are 'could inject' as sea snakes are rather docile by nature, and even when they do bite they rarely inject enough venom to kill a human. Nevertheless, if you're a diver, during the sea snake mating season, don't look for a thrill by provoking one of these creatures. Otherwise, these dangerous snakes won't hold back when they attack. The most venomous fish that we know about is the stonefish, and if that wasn't deadly enough already, its small size (no longer than 12 inches) and perfect camouflage make it quite hard to even detect. It's the dorsal fins you have to be wary of, which are sharp enough to pierce through a shoe so watch your step. Getting pierced by the dorsal fin will cause excruciating pain and cause flesh around the wound to die and induce swelling for months and could result in amputation if not treated right away. A large dose of venom without treatment which involves antibiotics and antivenom? could lead even to death. Another small creature that packs a big venomous punch is the blue-ringed octopus. Growing no more than 8 inches in length, this cephalopod feeds on small crabs and shrimp, yet still has enough venom to kill a human; actually, they have enough venom to kill nearly 30 humans within a matter of minutes. To put it another way, its venom is 10,000 times more powerful than cyanide. A bite from a blue-ringed octopus will cause paralysis and if not treated right away? pressure on the wound and artificial respiration? death is inevitable. Adding to the problem is that the bite itself is relatively painless, meaning you may not even know you've been injected until you start feeling the symptoms. Blue-ringed octopus only bite if provoked, so keeping your distance is the best treatment of all, especially since there is no antivenom at all for this deadly sea creature. A sea creature named after a war vessel from the 15th century, the Portuguese Man Of War may remind you of a jellyfish, but it is instead technically four different species that share the same exoskeleton. Another major difference is that these creatures rely on the current for propulsion as they have no means to move themselves through the water. Their sting is not nearly as fatal as the box jellyfish, but getting stung will cause an immediate burning sensation that can leave welts. In some circumstances it can cause heart and lung problems that can lead to death. The lionfish is the epitome of a creature as dangerous as they are beautiful. 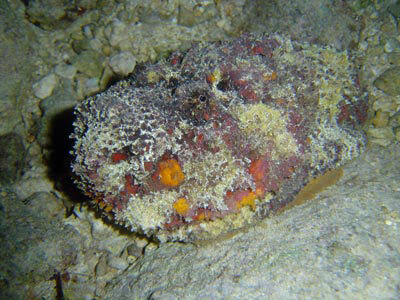 They are a species of scorpionfish that have venomous spines to protect themselves from predators. Getting stung is not necessarily fatal to humans, but it sure is painful. They are native to the Indo-Pacific region, but lately lionfish have been showing up in umbers in the Caribbean. As they are an invasive species, lionfish can thrive to dangerous levels in Atlantic waters as very few predators have the necessary venom resistance to survive an encounter. On TV: Check out episode 4 of World Fishing Journal to see some lionfish in the Bahamas here. 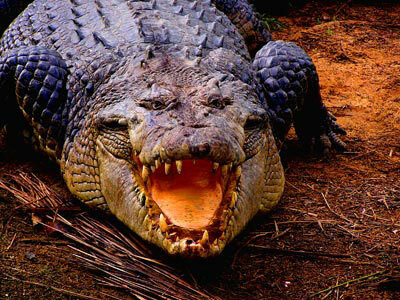 The saltwater crocodile, found in northern Australia, eastern India, and Southeast Asia, is the largest reptile in the world, and by extension the scariest. They can grow to weigh nearly 3,000 pounds and reach 20 feet in length. They inhabit marshes and estuaries, preferring freshwater, but do move out to deeper saltwater at times. Saltwater crocodiles are opportunistic feeders that are highly territorial, taking whatever is within range that looks easy enough to take as a meal, or just attacking to defend their home. They are deceptively fast on land, making them even more dangerous. The most dangerous creature in the ocean doesn't have a venomous bite, rows of sharp teeth, or even an obvious mouth for that matter. But nevertheless, the box jellyfish, also known as the sea wasp, is more responsible for human deaths on the continent of Australia than snakes, sharks, and saltwater crocodiles put together. A sea wasp has enough venom to kill 60 adult humans; a fatal sting from its tentacles can kill you in as little as three minutes. To make matters worse, even if you aren't stung with a large dose of venom, the pain is so excruciating it has been known to cause shock which can lead to drowning. They may look all ethereal as they float through the water, but if ever there was an instance not to judge by appearance, than the box jellyfish is Exhibit A.